Daniel Graham’s international career has taken him to the major music centers in the United States and Europe including Carnegie Recital Hall, Town Hall, and the 92nd Street Y in New York, Wigmore Hall in London, Staatsbibliothek in Berlin, and the Brahmsaal in Vienna. A student of Leon Fleisher, Nadia Reisenberg, and Donald Currier, Daniel Graham is a graduate of Peabody Institute at Johns Hopkins University (DMA), Yale University (MM) and the University of Minnesota (AB). Dr. Graham’s recordings of the rarely performed music of Adolph von Henselt, Karol Szymanowski, and Nikolai Medtner, remain the definitive recordings of that repertoire. Dr. Graham retired as a tenured professor of music at the University of Northern Colorado and moved to Los Angeles where he pursued a career in the non-profit sector first as the Executive Director of Development at UCLA, then later as the Executive Vice President of Development at the House Research Institute and the Executive Vice President at PBS SoCal. During that 28-year hiatus from music, Graham hardly touched the piano until his retirement in 2015 at the age 76 when he initiated a series of video and audio recording projects. 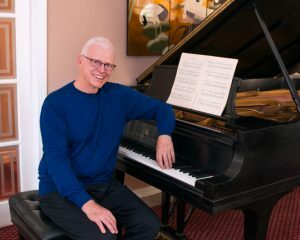 After retiring from my position as a tenured Professor of Music at the University of Northern Colorado, I hardly touched the piano for the next 28 years after moving to Los Angeles and pursuing a career in the non-profit sector. Then, after retiring at the age of 76, I was writing STRINGS, a novel about Alex Courtland, a concert pianist who gets entangled in an International conspiracy. While nothing that exciting ever happened to me, his journey inspired me to start practicing again. At 77 years old, I had to ask myself if it was even possible for me to recapture the performance standards I enjoyed as a 50 year old. I decided to put that question to the test. When I stopped practicing there was the usual stiffness and some minor arthritis, but my situation was further complicated by a condition called Dupretans Contracture. That caused the tendons in both my hands to contract resulting in a claw like hand. Not good news for a performing pianist. Repeated surgeries were necessary to correct the problem in both my hands. My studies with artist teachers Leon Fleisher, Nadia Reisenberg, and others, combined with my earlier career as a professor and performing and recording artist, armed me with the right background and discipline to initiate a practicing regiment that led to a series of video and audio recording projects. Currently, I am preparing to re-record Johannes Brahms’ Variations and Fugue on a Theme by Handel, Op. 24 that I recorded over 30 years ago. I will include the Waltzes Op. 39 by Brahms on that CD. Additionally, I plan to also re-record the 24 Etudes Op. 2 and 5 by Adolph von Henselt that were first recorded by me and released on the Musical Heritage Society label in 1974 (that’s over 40 years ago!) Comparing these new recordings to my previous ones should bring absolute clarity to the question of how successful my efforts have been in reclaiming my skills as a performing pianist. I hope you will explore these and other recordings and videos that I will continue to upload to the website.